My girls love sensory play. They enjoy beading bracelets, breading potato patties, and brushing doll hair as they touch, feel, and smell whatever project they're working on at the moment. Like most parents, I encourage sensory play, too, because it's valuable. Any activity that stimulates a child's sense of sight, smell, sound, taste, touch, movement, or balance is important to a child's development. Learn five benefits of sensory play as you encourage your child's little hands to do big learning. No matter how many times you explain something, kids learn best when they experience a hands-on demonstration of it. For example, when my girls were little, I tried to tell them that glue is sticky. They didn't believe me until they touched glue. They needed that sensory lesson to understand cause and effect. Your kids can also learn about gravity, states of matter, and other examples of cause and effect as they participate in sensory play. Like the sticky glue, my girls learned about "cold" when I gave them ice cubes to play with, and they finally understood "slimy" when we touched worms. Your kids will also memorize words and concepts when they see them in action. Many kids have trouble understanding the connection between a concept and a word, but sensory play can help. It can be the key that unlocks their ability to understand words and memorize language. What happens when my girls share a sensory table or sand box? They learn to share, cooperate, and work together. Kids have to express themselves, defend their actions, and make their point about why they want to play a certain way. Those social development skills help them succeed in life, which makes sensory play an important part of childhood. Have you watched your kids try to tie their shoes or turn book pages? The ability to do these tasks requires fine motor skills, and sensory play helps kids develop the dexterity they need for these activities. Give your kids toys, objects, and materials that require them to mix, measure, roll, and scoop. While they play and perform these fine-motor-skill activities, they develop the muscle movements and hand-eye coordination needed to perform real-life tasks now and in the future. 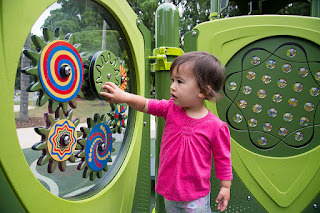 One of my favorite things about sensory play is the fact that there is no right or wrong. Kids can simply play with the materials however they want. They can use blocks as drums or building materials, and they can make mud pies or plant flowers in a dirt and water mixture. Open-ended play improves creativity as kids solve problems, engage in make-believe, and build self-esteem all while stimulating their senses. Sensory play offers these five benefits plus many more. The next time your kids need something to do, pull out materials that require them to see, smell, hear, taste, touch, move, or balance. Busy little hands yield big learning results that are well worth any mess your kids may make.